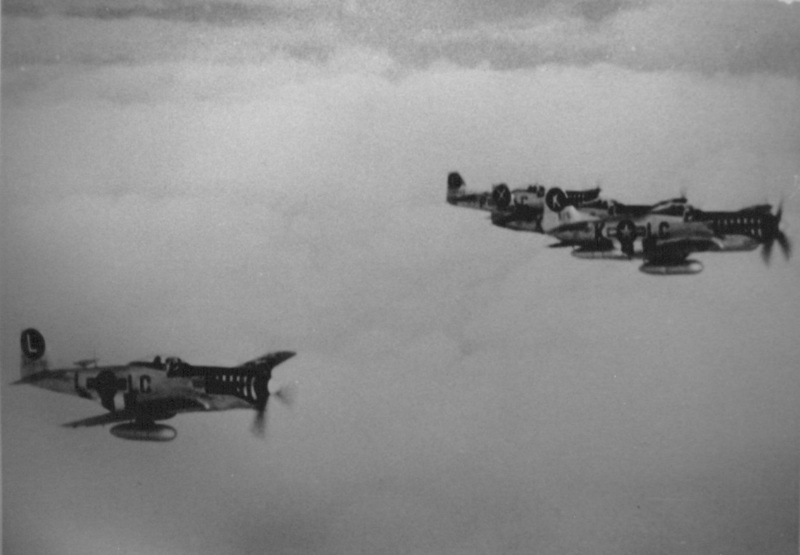 The 20th Fighter Group practising flying in formation with the P-38 Droopsnoot aircraft. A P-38 strafing a train in June/July 1944. 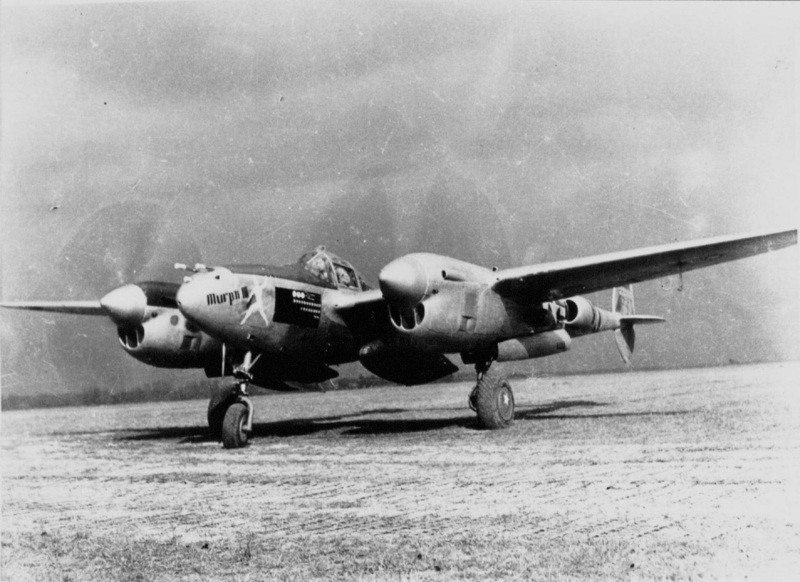 The Lockheed P-38 Lightning was designed in response to a 1937 order 'Specification X-608' for a twin engine interceptor with a tricycle landing gear. Designed by Clarence "Kelly" Johnson the aircraft had a strange twin boom design and carried a heavy armament of cannon and machine guns all located in the nose of the aircraft. The P-38 first flew on 27th January 1939 and after a few early teething problems quickly proved to fast and manoeuvrable for an aircraft of its size. The P-38 entered service with the USAAC in spring of 1941 but wasn't considered combat ready until the later P-38E model entered service. The 20th Fighter Group were first allocated P-38H models in January 1943 whilst based at March Field in California. It was a training Group at this point and having trained pilots they would be assigned to different combat groups overseas. This changed in March 1943 when the pilots being trained then stayed with the 20th Fighter Group and were deployed to the UK. Arriving in August 1943 an intense period of training followed along with some combat missions flown with the 55th Fighter Group from Nuthampsted airfield. Unfortunately the P-38 suffered a number of problems caused by operating at high altitude in the cold European skies that hadn't been noticed whilst operating at lower altitudes and in warmer climates. Superchargers regularly failed causing the pilot to have to shut sown the engine. This led to a high number of aircraft having to abort missions and return to base. A number of aircraft were lost due to engine malfunctions rather than enemy action. The aircraft also lacked an effective heater and pilots returning from missions often had to helped from the cockpit as they were so cold. 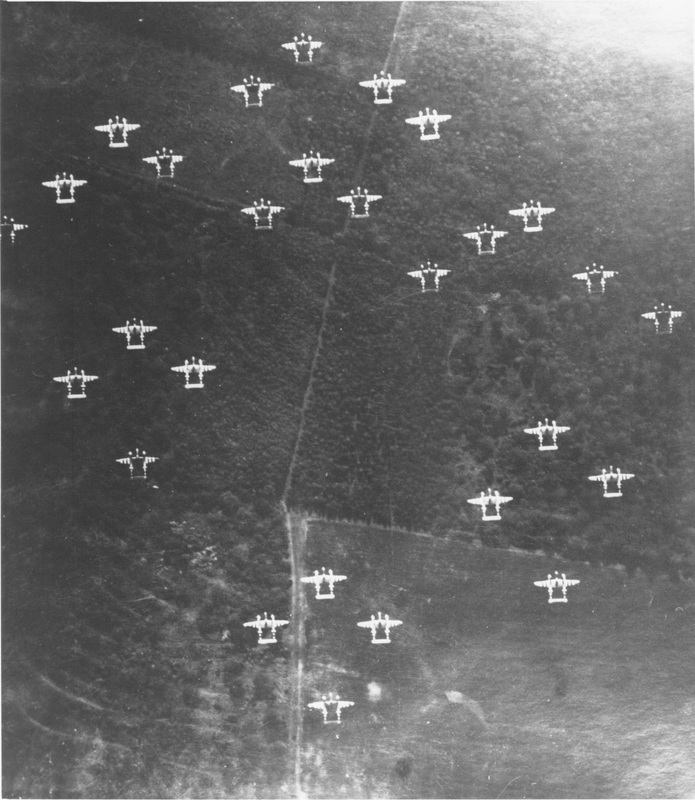 The 20th Fighter Group's Commanding Officer Lt Col. Mark Hubbard sent a strongly worded letter up the command chain in March 1944 bitterly criticising the P-38 as being unsuitable for the task it was being asked to carry out. Lt Col. Hubbard was shot down and taken POW days after sending this letter. The 20th Fighter Group struggled on slowly finding fixes to each issue as it appeared. However when the group were able to operate at lower levels and against ground targets the aircraft came into its own. With its heavy armament the aircraft proved ideal for attacking ground targets such as trucks and trains. 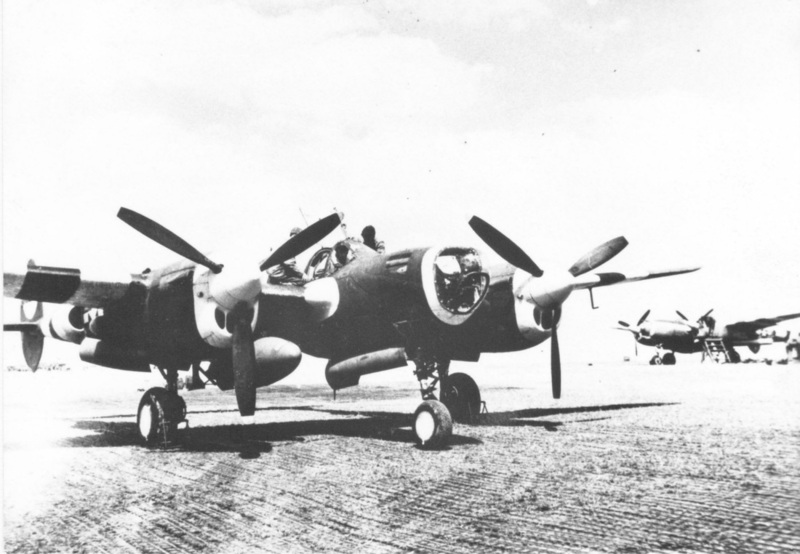 The 20th Fighter Group were also assigned a P-38J Droopsnoot aircraft where the armament was replaced with a glass nose and bombsight and a bombardier rode in the nose. The other aircraft would fly in close formation with the droopsnoot and all drop their bombs when the lead aircraft released theirs. Several missions were flown using this technique in the build up to D-Day. These missions weren't popular with the pilots who didn't like flying straight and level in close formation over enemy targets! By June 1944 the writing was on the wall for the P-38. The decision had been made to replace it in Eighth Air Force service with the P-51 Mustang and the Lightnings would be transferred to the Ninth Air Force for lower level tactical missions or to the Mediterranean Theatre where the warmer weather was more suited to the type. The forerunner of the North American P-51 Mustang first flew on 26th October 1940. The design originated from a British need for modern fighter aircraft. North American proposed to the British Aircraft Purchasing Committee that it could build a modern fighter aircraft incorporating the lesson learned from the fighting then taking place over Europe. The British ordered the project to go ahead on the 10th April 1940 and within six months the prototype had been assembled. 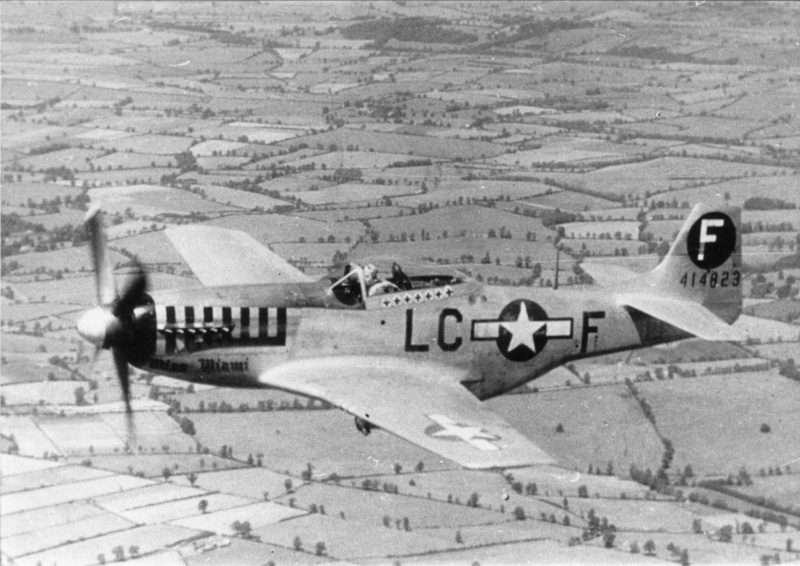 The early mustangs used an Allison engine which performed well at low level but poorly at the altitudes that most fighting was taking place at over Europe. The RAF therefore transferred them to the Army Cooperation Command for use as a tactical reconnaissance and ground attack aircraft. It was in April 1942 that Ronald Harker a test pilot for Rolls Royce flew an Allison engined Mustang and realised that fitted with a Merlin engine the aircraft could be a world beater. Having convinced Rolls Royce the first Merlin engined Mustang flew on the 13th October 1942. It was quickly apparent how good the Merlin Mustang was and Packard Motors was licensed to produce the Merlin in the USA. The first American produced Merlin Mustang flew in November 1942 but already the USAAF had placed orders for over 2,200 of the new aircraft. 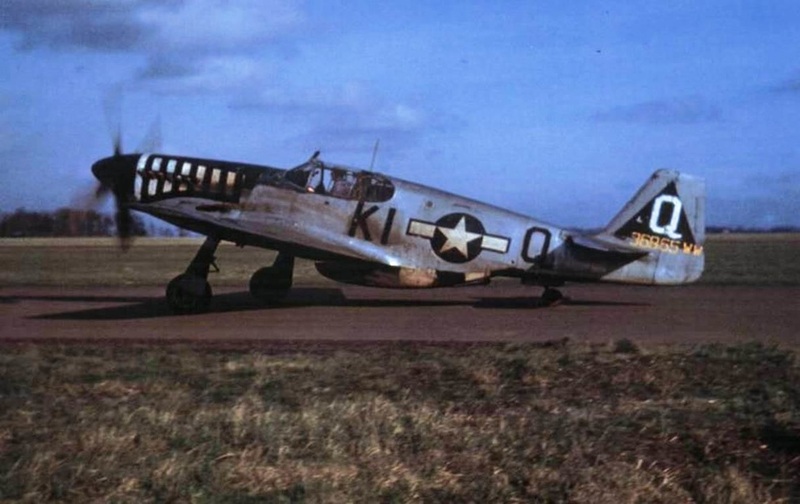 The first American P-51 Mustangs arrived in Europe in late 1943. When fitted with a pair of drop tanks the Mustang could fly to Berlin and back whilst still being able to meet the Luftwaffe's fighters on at least equal terms. The decision was made in early 1944 to convert all of the Eighth Air Force's Fighter Groups from the P-38 Lightning and P-47 Thunderbolt over to the P-51 Mustang. The 20th Fighter Group received their P-51 Mustangs in July 1944. Most pilots received about ten hours flying time in the Mustang before the Group started to fly operationally. The first 20th Fighter Group Mustang mission took place on July 20th 1944 when the 55th Fighter Squadron flew Mustangs on a mission. The whole group had transitioned by the mission of the 24th July 1944. The P-51 Mustang soon proved itself to be an excellent fighter aircraft. The 20th Fighter Group flew on the Frantic shuttle mission to Russia in September 1944 returning via Italy and although opportunities to meet the Luftwaffe in aerial combat were far fewer than earlier in 1944 the group still started to rack up a large number of victories. In early 1945 as the area occupied by the Germans was much reduced a large number of Luftwaffe aircraft started to become concentrated on the airfields still in German control. These airfields became targets for the Eighth Air Forces Fighter Groups and the 20th Fighter Group scored large numbers of ground kills in the last few months of the war. This wasn't without large risks however. The single water cooled engine of the Mustang meant that it was vulnerable to ground fire and a number of 20th Pilots were killed or captured having been hit whilst strafing enemy airfields. The Group's last mission was flown on April 20th 1945. P-51 Mustangs of the 77th Fighter Squadron, 20th Fighter Group. 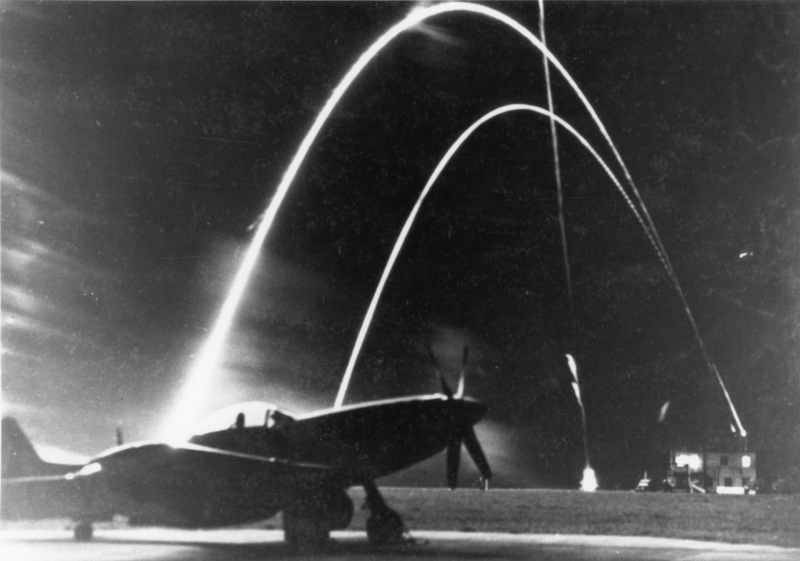 A 20th Fighter Group Mustang during VE Day celebrations.